Friday's meeting with Dr. Berggren brought the eight of us together to hear about our goals in Ethiopia from a physician's perspective. She explained the history of the Ethiopia Outreach program--an endeavor begun by medical students. 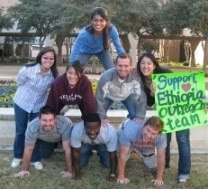 Dr. Berggren had accompanied UTHSCSA's Ethiopia Outreach team in 2008 and was able to provide us with insight from past trips. She emphasized three goals for our team as part of community service learning: preparation, mentorship, and reflection. Before we leave for Ethiopia, it is important for us to be well educated in the diseases afflicting the area as well as prepared to enter into another culture. Mentorship from Dr. Berggren, Dr. Usatine, and each other will allow us to learn from one another's experiences and hopefully improve methods of treatment. She also suggested that we keep track of a journal to record medical cases and personal/social observations which we will eventually present to our peers in order to gain feedback. Reflection is often the most significant part of community service learning since it is what leaves an impact on how we as medical students view global health.